The top lots in the auction were notes graded by PMG and coins certified by NGC. 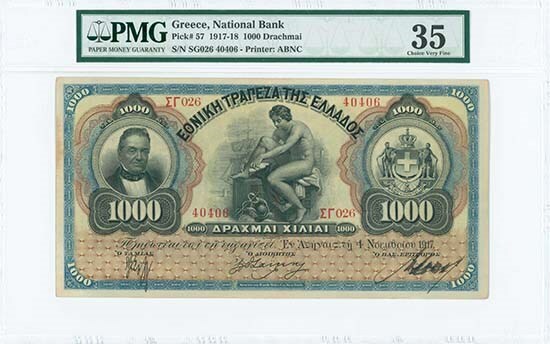 Notes certitied by PMG and coins certified by NGC comprised the top 10 prices realized in Public & LIVE Bid Auction 636, a sale presented by the auction house A. Karamitsos that concluded on April 6, 2019. The top lot in the auction was a Greece, National Bank, 1917-18 1000 Drachmai. Graded PMG 35 Choice Very Fine and featuring an image of the god Hermes front and center, it realized € 18000 (about $20,000 USD), far above its starting price of € 9000. Greece, National Bank, 1917-18 1000 Drachmai, graded PMG 35 Choice Very Fine. Realized: € 18000. A. Karamitsos has been in the philately trade for more than 40 years. For more information, visit Karamitsos.com.